Disability Sport NI recently launched a project which aims to improve the health and wellbeing of people with disabilities in Northern Ireland, through participation in sport and active recreation – and the Armagh City, Banbridge and Craigavon area will benefit greatly. The ‘District Council Disability Sports Hub Project’ gave all council areas disability sports equipment packs including: twelve sports wheelchairs, one rugby wheelchair, three track chairs, five hand cycles, four tandem bikes, three trikes, three boccia sets and one sensory activity pack. Council has now organised a session for anyone with a disability to come along and try out some of this equipment and learn how they can use it on a regular basis to help increase their activity levels. The taster session will take place on Saturday 21st October from 10am to 1pm at Brownlow Community Hub. For more information or to book your place please contact Ryan or Clare on 028 3831 1690. 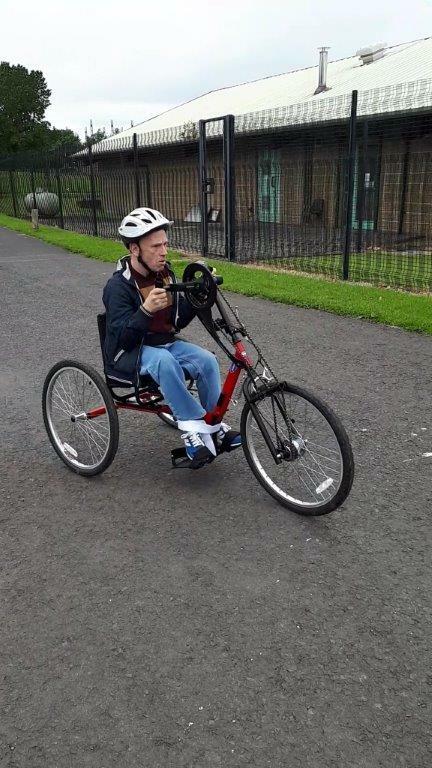 This wide variety of equipment is suitable for both adults and children with the track chairs and hand cycles being a brand new addition to the borough. These, along with the tandems and trikes, can all be hired from Craigavon Watersports Centre and will also be available from other locations throughout the borough from next Spring. “We are absolutely delighted to welcome this sports equipment pack to benefit people within our community who have a disability,” commented Councillor Declan McAlinden, Chair of the Leisure Services Committee. Funded by the Department for Communities through Sport NI, this £500,000 project is part of the Active Living: No Limits 2021 Action Plan.